At the dawn of the 41st century, the future of Earth will be decided in the stars. Next summer…the rebellion begins in 4001 A.D.! In the tradition of BOOK OF DEATH, ARMOR HUNTERS, and HARBINGER WARS, Valiant is proud to announce its most ambitious crossover event yet: 4001 A.D.! 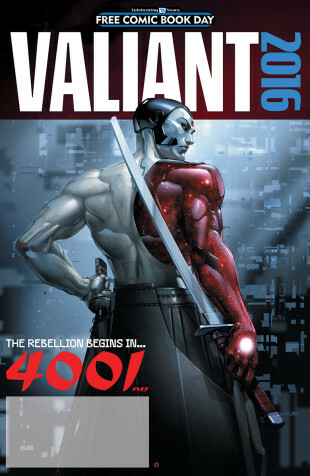 Beginning with an all-new prologue in the pages of the VALIANT: 4001 A.D. FCBD SPECIAL on Free Comic Book Day 2016, the forces of the future unite behind the fallen guardian of New Japan, Rai, in 4001 A.D. #1 (of 4) – the FIRST ISSUE of an all-new, four-issue event series from New York Times best-selling writer Matt Kindt (NINJAK, DIVINITY, Mind MGMT) and superstar artist Clayton Crain (RAI, X-Force)! Earth must rise. Father must fall. Rai! Eternal Warrior! X-O Manowar! Bloodshot! Geomancer! Armstrong! And more! The war for the ultimate fate of humanity begins in 4001 A.D.! In the wake of Free Comic Book Day 2016, 4001 A.D. #1 (of 4) kicks off Valiant’s landmark crossover event of the New Year in May 2016! Then, the war on New Japan will spread with the return of RAI’s own titular ongoing series and glimpses of the other heroes of 4001 A.D. in a new series of one-shots throughout the summer. Further details on more 4001 A.D. releases will follow in 2016. Next summer, the future of the Valiant Universe looms large with an all-new entry point into the most acclaimed publishing line in comics, only in 4001 A.D. #1 – coming in May from Valiant superstars Matt Kindt and Clayton Crain! Plus: Don’t miss a never-before-seen prelude to the blockbuster comics event of the summer in the VALIANT: 4001 A.D. FCBD SPECIAL as Rai’s crusade to save the future from itself starts here with an all-new story from Matt Kindt and Clayton Crain! Then, the biggest Free Comic Book Day release of the year continues with exclusive looks inside Valiant’s next can’t-miss milestones, including A&A: THE ADVENTURES OF ARCHER & ARMSTRONG #1 by rising star Rafer Roberts and comic book superstar David Lafuente, and DIVINITY II #1 (of 4) by New York Times best-selling writer Matt Kindt and blockbuster artist Trevor Hairsine!